Strasbourg, an Alsatian Mongrel of both French and German influence, founder of the Christmas tree tradition and possessor of one of the worlds finest cathedrals, was a far more pleasant spot in which to spend the Christmas holidays than had been San Pietro a year before. The 36th remained in Strasbourg only five days, patrolling the medieval streets in search of German stragglers and agents, who had never left the city even after its capture by French forces under General Le Clerc one month before. Down on the river banks, bordering Germany itself, men of the 36th stood the watch on the Rhine. Uncle Sams Christmas present to the 36th Division was relief from the line, whole and without condition. By Christmas Eve the Division had set an endurance record for continuous combat days (with infantry elements in the line), 133. Dating from the August 15 invasion, it had rushed up from the beaches, plodded on without rest through the bitter Vosges foothills, forced high St. Marie Pass, and stopped the fierce German attacks from the Colmar pocket. Quiet Strasbourg itself was a decided change after all this, but now the Division would move to a rest and training area near Sarrebourg, fifty miles to the rear through Saverne Gap. It started moving on Christmas Day, the day the Division Chaplain, Lt. Col. Herbert E. MacCombie, gave a party for the city orphanage, and all the G.Is chipped in from their Christmas packages. In order to contain the Von Rundstedt offensive that had ripped into the First Army line in Belgium and reached its high-water mark on December 24, the Allied Command was compelled to draw troops from the Seventh Army, proportionately thinning out the dispositions in its sector. 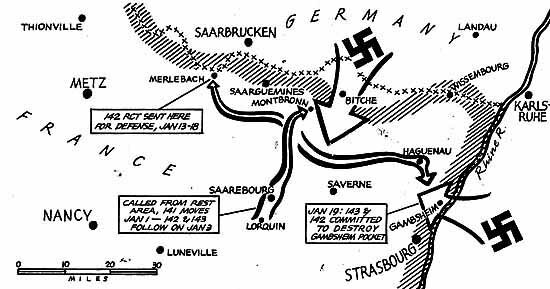 The Seventh Army line was widely extended to the left to a point near Saarbrucken, leaving units which had reached the German border on the right, near the Rhine, in an exposed position, defensively. When failure in the Ardennes Offensive became apparent and Allied troops began to bite away at the flanks of the Bulge, the Germans turned their attention to the Seventh Army sector and seized the opportunity to stage a major attack, both in the hope of gaining a psychological advantage and to offset any further shifting of Allied. forces to the Belgium battle. They chose for the point of their assault, the area at Bitche, in the center of the Seventh Army line, and struck boldly for Saverne to close the pass there to Strasbourg. Success would have boxed in the whole VI Corps on the right, and imperiled the loss of all Alsace. Days in advance of the German attack, a feeling of sullen expectation permeated the chill December air, penetrating even to the rear where Division men, now in SHAEF reserve, started their training. There were several alertsalerts to be ready to rush to either XV or VI Corps on short notice, alerts for enemy paratroopers supposedly dropped in rear areas. At midnight of New Years Eve, traditional hour of celebration, the Germans launched their attack south of Bitche. Before the day was out the 141st had hurriedly departed from Saarebourg, moved forty miles to close a gap on the right of the 100th Division, caused when the Germans filtered through on the left of the VI Corps sector, 141st infantrymen immediately upon arrival took up positions in an eight-kilometer arc to protect the towns of Enchenberg, Lemberg, and Goetzenbruck, with Montbronn at the center of communications. This was on the flank of the German penetration, which in another several days reached its peak at a depth of six miles at Wingen, in the 45th Division sector. Confusion, near-panic and wild rumors were circulating freely when Division elements arrived. The Germans did what they could to heighten deception by using captured equipment, in wearing Allied uniforms and infiltrating "jeep parties" under the guise of American soldiers. 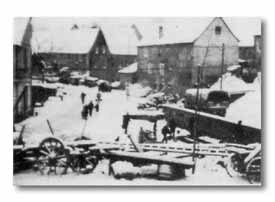 By noon of January 2 all units of the 141st were in contact with the enemy, and a critical situation obtained as the Germans plucked away at Lemberg in the center of the line and threatened encirclement on the south flank at Meisenthal and Sarreinsherg. Part of Company I was cut off in the fighting north of Lemberg, but the enemy did not get through. 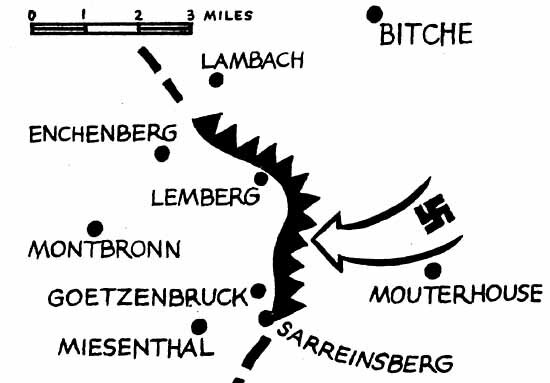 Next day Germans dented the line between Lemberg and Goetzenbruck, but the loss was restored before dark. The remainder of the Division traveled the icy roads to Montbronn in a snowstorm after dark of January 3, the142nd and 143rd backing up the 141st Army orders specified the employment of only one RCT at a time; even forbade the stirring up of a fight by any direct offensive action. Because of the intense cold, regiments rotated on line duty for three-day periods. Companies A and C of the 142nd Infantry, in an attack that required special Army permission, sliced off an enemy bulge and netted 50 prisoners on the morning of January 8. Next day the Germans threw a battalion against Lemberg, which, after initial surprise, was driven off under heavy artillery concentrations. On January 11, the 3rd Battalion, 143rd, pulled off a "Chinese" or mock attack that produced a violent German reaction and a heavy shelling of Lemberg. A very distasteful job during this period emphasized the seriousness of the general situation. With pick and shovel, reserve 141st and 143rd elements and the 111th Engineers hastily prepared a secondary or switch line several miles to the rear. Certainly the Germans had been compelled to do this type of thing all along, but to Division troops this was an entirely new military method. The full weight of a German attack was still anticipated but never developed at Montbronn. An Army order sent the 142nd Infantry west to the XXI Corps to back up the line before Saarbrucken while a relief of the 103rd Division was carried out, January 13-18. Such quiet prevailed in this sector that hardly a shot was fired.